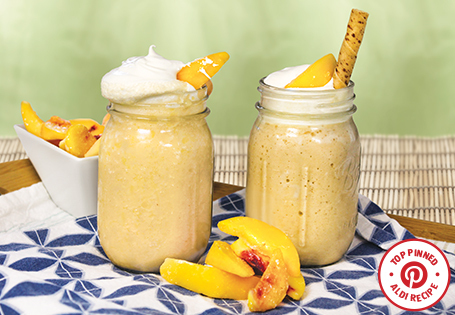 Creamy dairy-free peach ice cream and rum make this cocktail an irresistible summer treat. For the dairy-free ice cream: In a blender or food processor, combine ½ cup frozen peaches, almond milk, honey and maple syrup. Blend until smooth. Freeze until firm, about 15-20 minutes. For the simple syrup: In a small pot over medium-high heat, combine brown sugar, water and cinnamon. Whisk until sugar dissolves. Boil mixture, stirring occasionally until thickened, about 5 minutes. Remove from heat, let cool, reserve. For the cocktail: In a blender, combine ½ cup peach ice cream, 3 tablespoons cinnamon simple syrup, 1 tablespoon lemon juice, 2 tablespoons rum or bourbon and 2 tablespoons almond milk. Blend until smooth. Divide cocktail between 2 glasses. For the whipped topping: In a measuring cup or small bowl, dissolve corn starch in soy or almond milk; add honey and vanilla, mix well. Pour mixture into a blender; set to high. Slowly pour in coconut oil and blend until mixture thickens, approximately 4-5 minutes. If using almond milk, let stand an additional 5 minutes. Spoon desired amount of whipped topping on top of cocktail. Garnish with remaining ¼ cup peaches. TIP: For added decadence, replace dairy-free ice cream with reduced fat peaches & cream ice cream, top with whipped dairy topping and use cream wafer rolls for edible straws.